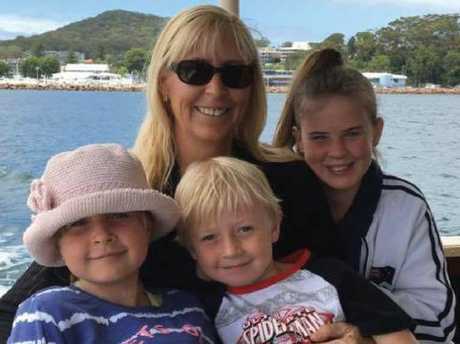 THE family of Stephanie King has opened up about their "heartbreak" and "devastation" after the tragic accident which claimed her life and that of two of her children, adding they were "proud" the mother acted heroically by sacrificing herself for her kids. They also insisted this morning that Dulguigan Rd - where the family was travelling along to get home after visiting their flood-damaged school - was open when Ms King drove along it and was definitely not closed. Father Matthew Kabealo with Ella-Jane, Chloe-May and Jacob. The "hero mum" would never have driven along it if it had been, they said, and actually warned people about going on certain roadways in the aftermath of the floods in Tumbulgum. Ms King, 43, died alongside two of her three children, Ella-Jane, 11, and Jacob, 7, when their van plunged off the muddy road on Monday and crashed into the river. Chloe-May was able to escape and ran for help. Stephanie King and her family. 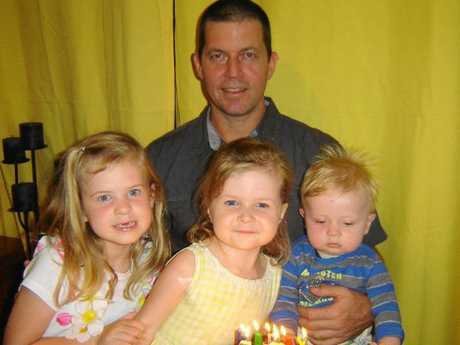 Tumbulgum Pastor Rob Stuttle made the statement on behalf of Chloe-May's father Matthew Kabealo, his only surviving daughter and the rest of the family this morning after spending three hours with them yesterday. "They have asked me to convey that the family are heartbroken and devastated at the great loss of Stephanie, Ella-Jane and Jacob," Pastor Stuttle said. "It's a tragedy that they are suffering with enormous grief and have asked that you respect their privacy at this time. "Chloe-May and Matt are doing as well as you can expect in the circumstances." Matt Grinham and son Thomas Grinham, 15, use a depth sounder to locate the car in the river. Pastor Stuttle said that the family were incredibly "proud "of Ms King for the way she put her kids first. 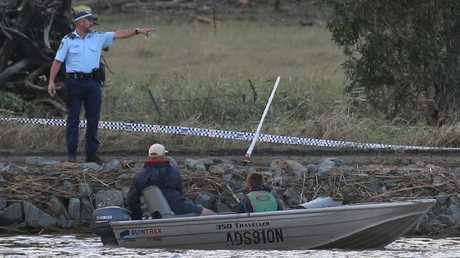 "I believe that (Chloe-May) was able to release the seatbelt and swim out of the car," he said. "They are all so proud of her (Ms King), it's come out that really she was trying to look out of the children's lives before her own ... that only confirmed what we already knew as a community, what type of person she is." He said the family wanted to make it clear the road was not shut - and Ms King had actually been warning people in the aftermath of the floods not to drive along certain roadways if they were dangerous. "The family also wanted me to say again that the road was not closed when Stephanie drove along Dulguigan Rd that fatal afternoon," Pastor Stuttle said. "Stephanie is a hero and the police have confirmed this and Chloe-May is a brave young lady. "If it looks like the road was closed, it looks like neglect that she actually drove through a closed road and to do that would actually be neglect. "She actually goes on her road very regularly, it's the road she takes her children to school, it was just very muddy and slippery at the time. 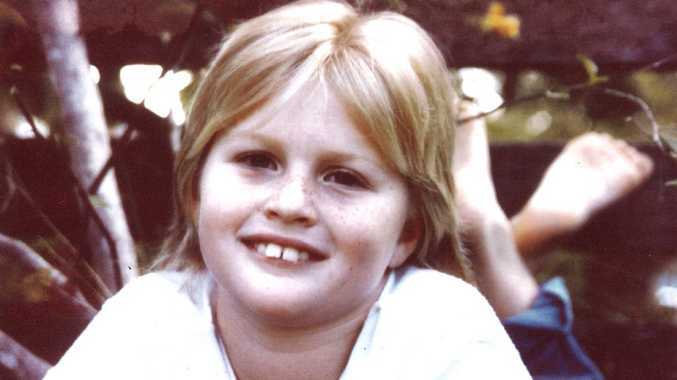 "She was actually on her way back from (Dungay Public School) to home." Pastor Stuttle said the family wanted to thank everyone who helped them. "They particularly wanted to thank everybody who helped at the scene of the accident, as some put their lives at risk that day to try and save the family," Pastor Stuttle said. 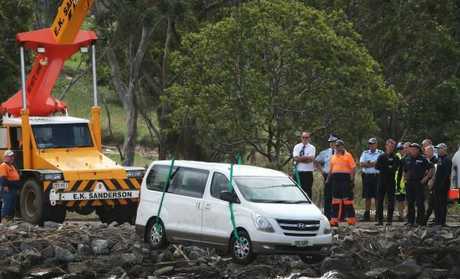 "They would like to thank the SES, police and divers and retired highway officer Matt Grinham who was first on the scene and dived into the cold muddy waters of the Tweed risking his own life." The community has rallied behind Chloe-May and Mr Kabealo, raising $90,000 by this morning - just three days since the family lost their lives. Pastor Stuttle said Mr Kabealo was incredibly grateful for this. "(They are thankful) to you the public for all your love and support and best wishes at this time," he said. A fundraiser is also being organised at Tumbulgum tavern, where Ms King worked for three months towards the end of last year and was described as "lovely" by her friends and colleagues there.